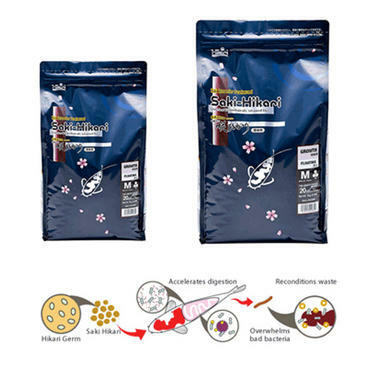 Saki-Hikari, professional koi diet, has been developed as a result of decades of first hand breeding experience and considerable insight from a number of Japan?s top professional breeders. Saki-Hikari is the diet used by the All Japan Koi Show Grand Champion winners in back-to-back shows since 2003. If you want the very best for your koi, look no further than the leader in koi nutrition worldwide, Hikari! Saki-Hikari Growth was specifically developed for raising jumbo koi. Our intent was to provide a nutritional package that would help koi breeders raise koi that were bigger than previously possible without negatively impacting water quality or the overall health of their koi. Saki-Hikari has the proper levels of necessary vitamins, minerals and digestive enzymes. It also contains a completely balanced combination of proteins, fats and carbohydrates. Finally, the inclusion of beneficial living microorganisms promotes improved digestion and waste reduction. For the championship body your koi deserve and you crave, feed Saki-Hikari Growth!